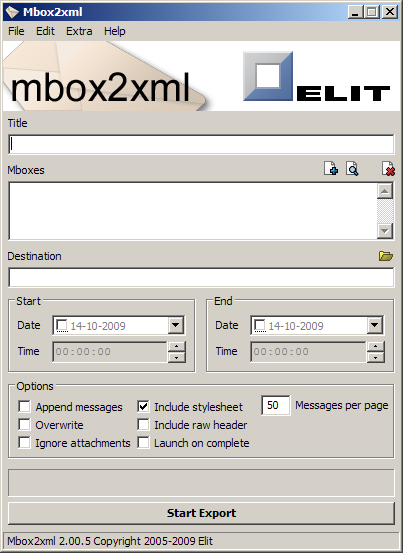 Mbox2xml is an email archiver for Mozilla Thunderbird, which extracts messages from the mbox format used by Mozilla Thunderbird and stores them in an XML format, which can be viewed as web pages in a browser. Backing up emails can be a cumbersome task, and the results are often not very user friendly nor easily accessible. These are the two main reasons why Mbox2xml was created. The archives should be easily accessible on any computer from any data storage device. The tool should allow for automation so it can easily be integrated with existing back-up methods. Therefore it was decided that the program should store the exported emails in an XML format which, together with a provided stylesheet, can be viewed in any modern webbrowser, no matter where the backup is stored. Also, XML is easily imported into existing software solutions. And finally, Mbox2xml has both a graphical user interface for ease of use, and a command line version for easier automation. The graphical user interface offers a convenient way for you to combine multiple mbox files into one xml export. The selections you make and options you set can be saved in a file, so they can be easily reloaded next time you use Mbox2xml. The command line version can be found in your install directory under the name 'mbox2xml.exe'. This version can also use the configuration files created with the graphical version. Type 'mbox2xml -h' at the command prompt for further details. The following table shows an overview of most the features and settings of Mbox2xml. Title The title to be shown at the top of your export pages. Mboxes This element show a list of the mbox files you've selected for export. Manually select an mbox file to add to the list. Have Mbox2xml search a certain location on your hard drive for mbox files. Destination The location on your hard drive to which Mbox2xml will write the exported messages. Browse for a location to which to export your messages. Start Date & Time Click on the select box and choose a date from the pop-up calendar. All messages sent or received on this date or later will be exported. To remove a selected date, uncheck the box next to it. Use the time box below if you also want to add a specific time. Append messages If you select this option and Mbox2xml finds a previous export at the given destination, then only messages newer than the newest in the old export will be exported and appended to the old export. Overwrite This option tells Mbox2xml to overwrite any older exports found at the export destination. Ignore attachments Mbox2xml will not export attachments when this options is selected. Include stylesheet If this option is selected, Mbox2xml will include extra files to the export which make it viewable in any modern webbrowser. Include raw header Use this option to force Mbox2xml to include ALL header information from your emails. This is generally not needed, but may suit advanced users. Launch on complete When this option is selected, the export will be opened in your default webbrowser after the export is complete. Messages per page If your export has more messages than indicated by this number, then Mbox2xml will devide them over multiple pages. This can be helpful when exporting large amounts of messages, since webbrowsers can have trouble rendering them in a single page. Start Export This button starts the export process.